BENJAMIN ZYLA, University of Ottawa. Presented by the CIPS and the Fragile States Research Network. Since the fall of the Berlin Wall, NATO’s middle powers have been pressured into shouldering an increasing share of the costs of the transatlantic alliance. In Sharing the Burden? 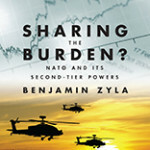 Benjamin Zyla rejects the claim that countries like Canada have shirked their responsibilities within NATO. Zyla argues that, proportionally, Canada’s NATO commitments in the 1990s rivaled those of the alliance’s major powers. At the same time, he demonstrates that Canadian policy was driven by strong normative principles to assist failed and failing states rather than a desire to ride the coattails of the United States, as is often presumed. Benjamin Zyla is Assistant Professor in the School of International Development and Global Studies at the University of Ottawa. Prior to this, he held a Social Sciences and Humanities Research Council of Canada (SSHRC) Postdoctoral Fellowship, and was a fellow at the Europe Center at Stanford University, the Centre for International Relations at Queen’s University and at CIPS. His research interests focus on the security-development nexus, fragile states, peacekeeping and peace building, human security, humanitarian interventions (and values thereof), international peace-operations, NATO, and questions related to Canada and the world.